Every person at one time or the other may have had to work in groups, be it while the person is in college or while at work. There are many instances in life that may have called for teamwork. At the same time, on some other occasions, it is the choice of the person if to opt for teamwork or to work individually. Both have they’re own positive and negative points. This article tries to give an idea about the advantages and disadvantages of working in a group. Different people have different ideas regarding the work to be done. There are few people who would like to work alone, whereas few prefer to work in teams. The best way to solve such a situation is to assign the right task for everybody accordingly. As a coin has two sides, working individually and working in a team both will be having their own advantages and disadvantages. Let us take a look below to find a few pros and cons of them. Teamwork helps in increasing collaboration and has a scope for brainstorming, which results in getting more ideas. Therefore you can see a growth in productivity. To solve complex problems and to complete difficult tasks, team works better than a individual. You can improve you skills while working in a team, as a team will be having people with different skills and abilities. Team work help you improve your communication skills. While working in a team, conflicts might occur in case when one person works less than the other. When working as team, lot of meetings need to be scheduled. But in case if not handled properly can result in loss of time and decrease the efficiency of team. Decision taking process will be prolonged and delayed. You need not depend on others and also can decide things independently. You will be the one who is responsible for the work done, you don’t have to share the credit with others. You are sole person for the work, so you cant blame on others when things go wrong. To get the work done at times , you need to motivate yourself. There are chances of getting bored as you will be working independently, all alone. At times if you are sick and not able to do work, the whole work gets delayed as there will no one to complete it on your behalf. Here we will be discussing few common problems, which group members face when the work is not done effectively while working in a group. Working in a group is an effective and powerful way to learn, and is highly relevant to the work type and workplace. One might opt to work in a group, due to many reasons. What one needs to see is what works best for the job as well as the person. So if you are confused on why work in groups or positives or advantages of teamwork then here are some points on the positives and advantages of working in a group. It is been found that one of the main benefits of working in a group is that it helps to raise the complete output. If working in a group, everyone works together making use of the best of their skills to make sure of quality output. It will also guarantee that there has not been any compromise on the quality of the production, whilst working as a team. This is one of the best benefits of team working. One thing to realize is that more the number of people that joins the group, the resources also increase alongside it. This is one of the pros of teamwork. For example, as more people are added, the total ability of the person also increases. Other than the skills, the experience of each new person is as well added to the group. If the person is working individually, he will not have the support from the other people in the group. One good thing about working in groups is that if in case someone is not keeping well or if they miss the work for some reason, the job can still be done properly and efficiently by the rest of the people in the team. Since working in a group there are people who are aware of what’s happening at work. This is not possible if a person is working alone or individually. If one works in a group, they can also ensure that the ideas or suggestions, which are not at par, are rejected at the very beginning. This is one of the benefits of group work. It is seen that more often that, people in a group can go on to learn new things from the others. They get the option to learn from each other. All people while working in groups have their own ideas, from which another person can learn so many things. On the other hand, when one is working individually, they have to do things on their own. You do not have the time to learn anything from anyone else. Learning new things is one of the benefits of group work. When working in a group, each one gets the opportunity to come out with their own ideas and suggestions, thus paving way for new methods on how to complete the job, properly. Each one can work towards the success of the work. Since it is a large group, there could be quite a few of the suggestions or ideas by some of the people that are innovative and novel, which could help the job to complete successfully. While working in a group, everyone gets the opportunity to communicate with others well within the group. Each idea or suggestions, whoever it is by is considered and thoroughly discussed before the group arrives at a conclusion. Hence, we can find that the flow of conversation or communication is smooth and effortless within the people of the group. This contributes a lot to the success of the job, given. This can also be called as group discussion. When one is committed to working in a team, the person can go on to encourage and support the performance as a group. A person, totally dedicated to the job at hand and to the team, will also make sure to be present to do the job. This is known as total team commitment. At the same time, working in groups is not without its disadvantages. It may not work out for the best, all the time. Trying to get people in a group to work together is very strenuous and also takes up a lot of time. At the same time, if everyone comes together to work towards the success, there is nothing better than that. 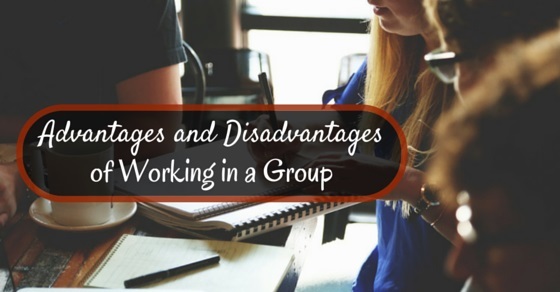 Here are some negative points of working in a group or disadvantages for group work. It is quite possible that while in a group some of the customers may not do that much work, while others may work hard. This inequality in the work done could cause trouble between the people in the group. It also causes bitterness amongst the members of the group, because some may be getting acknowledged for a work that they have not even done, at all, while others may have strived hard to get that honor. Jealousy, in such a scenario, is without a doubt inevitable. When a wide variety of people start to work in a group, disagreement is sure to arise between all the people in the group. Each person may have their own ideas which could conflict with what the other person has to suggest. Some people in a group might also find it difficult to accept suggestions or ideas from another person. This conflict could as well put a stop to the flow of work until the issue is resolved. While working in a group, there is no place for individual or independent thinking. It is by no means a one man show. It is more of a group effort to complete a job properly. Each idea and suggestions put forward by all the members of the group have to be taken into account for successful completion of the work. In view of the fact that it is a group effort, suggestions and ideas from all the people in a group have to be taken into account. Prior to making any decision, all aspects are to be thoroughly discussed and considered, which consequently takes up a lot of time and energy. When in a group especially a large one, it is very easy for the person to avoid work and leave it to others to complete. It may take some time before someone actually pays attention to this fact. One can work, in whatever way possible and can also get acknowledgment for work done by someone else, as it is teamwork and the person is part of the team. Whenever you need to work as a group, the group thinking becomes more relevant. Because of this reason, the creativity has been stumped. One can never make a good decision, as each and every person of the group will have a say in it. The whole process could be time-consuming while working in a group. It takes a lot of time since there is the need for agreement and coordination from all members of the team. If the person opts to work in a group, when the work is being distributed chance is not everyone gets an equal amount of work. Some one might end up with more work, while other might get only little to do. This discrepancy in getting the work can also lead to conflict. One other issue while working in a group, is that some of the people may just hang around, gossiping or loafing around without doing the job. This could result in lesser productivity from their end. It is often found that people working in a group can work better when they are comfortable with each other. Engaging in social activities together can help one to overcome this problem. Once, the role to be assumed by all is clearly marked out it becomes easier to work in a group. The people need to have a proper ongoing exchange of ideas. In Order to get the best of output, one needs to focus more on the benefits of working in a group. Thus, working together can prove to be advantageous for the project, as well as the company.